SoundBridge is a full featured Digital Audio Workstation that emphasizes mobility, connectivity and ease of use. We’ve optimized the user experience and made the application high resolution with 5 color schemes, added channel strip & plugin presets, a swing tool, advanced mixer routing, and much more! SoundBridge is an omni-recording experience, transcending desktop, mobile, and in-browser recording environments. Our online collaboration engine allows you to seamlessly connect, communicate and transfer data, among an unlimited number of collaborators per project. RitMix is a powerful drum machine containing a 16-step sequencer, MPC-style pad performance section, extensive editing capabilities, and a solid built-in mixer. 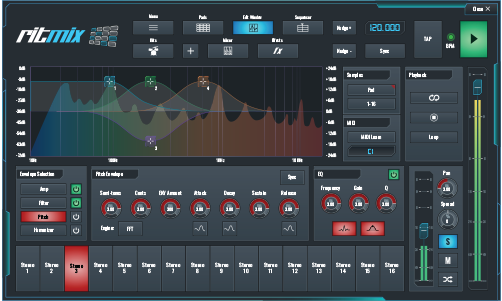 It consolidates the most essential functionality needed to make complex rhythms on-the-fly and plenty of insert FX, humanizers, and randomization algorithms. Activation Key needed and you can get it by registering to their site which I recommed. Hat das schon Mal jemand getestet ? War auch schon auf der Seite und frag mich wo nu eigentlich der Haken ist (ich mein nach free/opensource sieht die Seite nicht aus). Wollen die irgendwelche Ad-/Soundpacks verkaufen und damit die Kohle machen oder wie ? Ansonsten sieht das Teil ja von der Optik echt schick aus. Man muss sich auf jedenfall registrieren und wie ich gesehen habe, muss man online bleiben, sonst geht das Programm nicht.